Built Green staff spent a year collecting and analyzing data for a first-of-its kind post-occupancy study, which was released last fall. The study used electricity consumption data provided by Seattle City Light for every single-family home built in Seattle in 2014. 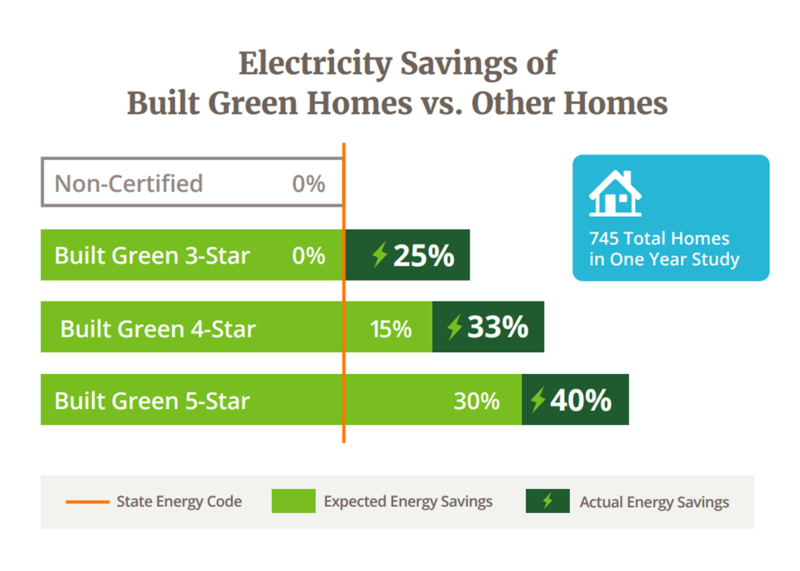 Built Green® homes were compared with non-certified homes to see how much electricity Built Green homes really are saving and to ensure the energy modeling protocol in place is leading to the desired efficiencies. It turns out that Built Green homes are saving even more electricity than we thought, with 4-Star homes using 33% less electricity on average than non-certified homes! This study is unique thanks to its size (we examined over 700 homes) and the fact that it compares certified to non-certified homes. Read the study. As a result of the study, Built Green received some great media attention. Notable stories appeared on KING 5, KUOW, and GeekWire. Built Green’s 2017 Conference was a big success, with participants rating the conference as “excellent” overall, according to our survey. The day started out with an engaging presentation by Alan Durning of Sightline Institute, which highlighted the intersection of sustainability, urban density, and affordability. The day also featured a panel with Alan, both Seattle mayoral candidates, and city council candidate (now councilmember), Teresa Mosqueda. The full session, moderated by Aaron Fairchild of Green Canopy Homes, can be viewed here. Additionally, there were other great sessions on net zero building, biomimicry, accessible solar, making the pitch for green remodels, and much, much more! We hope to see you at the 2018 conference! 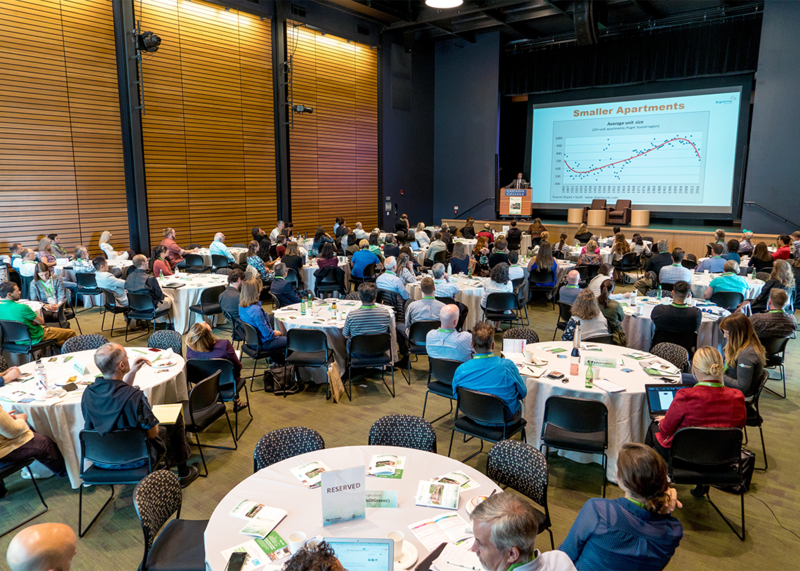 In addition to increasing public awareness of Built Green through our conference and through media coverage, we do this by making sure the program stays current and continues to push the envelope on green building. At the conference, we announced the launch of our new Net Zero Energy Label, which bequeaths special attention to Built Green projects that go above and beyond in their energy commitments. We’re seeing more of these incredible projects and we wanted to ensure they are well-supported by Built Green in telling their story. The Net Zero Energy Label is now included on the Built Green checklists and we have developed marketing materials to support projects that achieve this! Built Green values its relationships with local governments and utilities and we work alongside them to advance green building in their respective jurisdictions. Green building incentives, which come in many forms, can be effective ways to do this. In 2017, four new incentives that include Built Green certification were launched by SnoPUD, Bonneville Power Administration, and the cities of Shoreline and Bellevue. 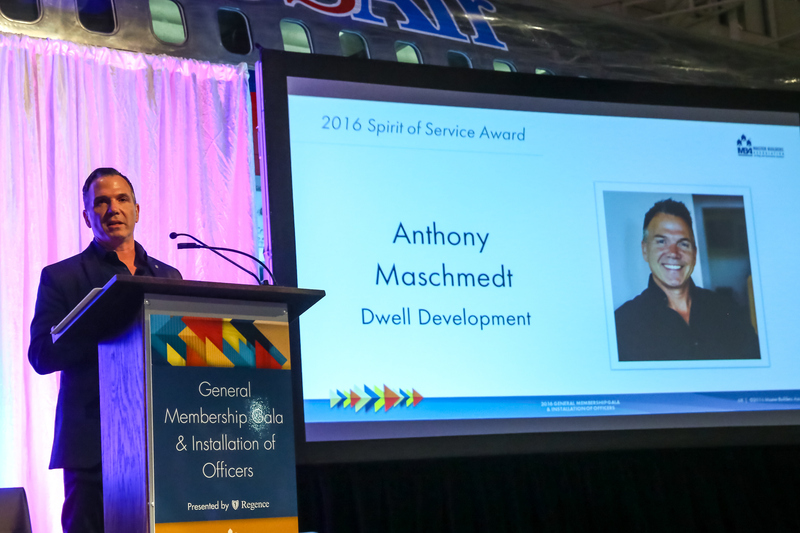 These incentives range from rebates to code departure possibilities to reduced fees. These incentives are in addition to many other incentives on offer—if you’re building green, make sure you take advantage of these opportunities! 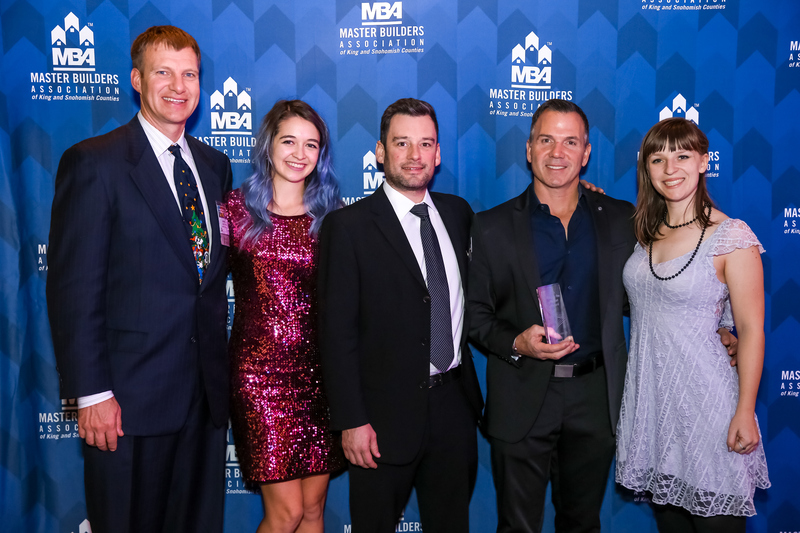 Built Green certified a total of 836 projects in 2017, including one Emerald Star—the second in Seattle! 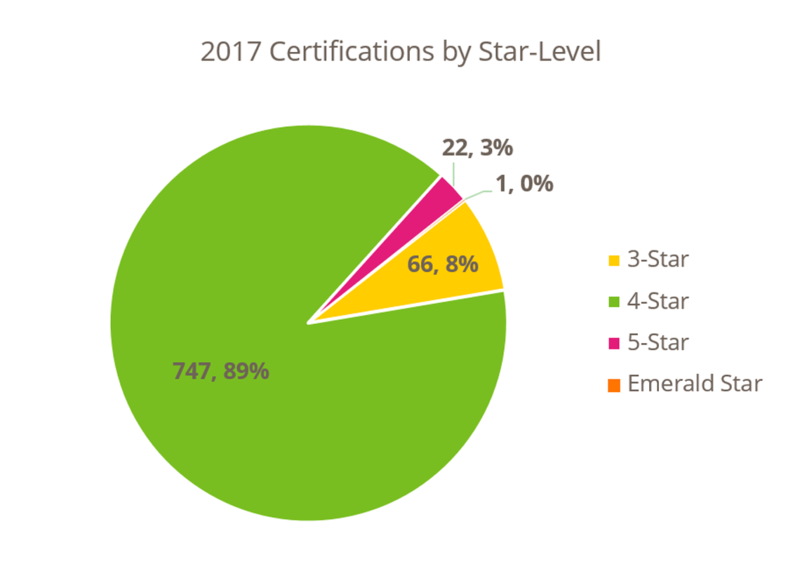 Though certifications were down compared to 2016, the star-level profile remained nearly the same. Seattle still dominated the Built Green market, with 77 percent of 2017 certifications occurring within the city. The geographical spread was stronger than in 2016, however, with 12 other cities playing host to projects. Who built these projects? 199 Built Green builder members! Isola Homes certified the most projects—88—while 30 builders certified one project a piece. Built Green’s market share remains incredibly strong in Seattle, representing over a third of all residential development and an incredible 65 percent of all new single-family homes and townhomes! This is calculated by comparing the number of permits pulled to Built Green certifications; if we were to calculate this by the number of enrollments,* the share would be significantly higher. Though certifications were a bit lower than in 2016, the number of enrollments was much higher, portending well for future years! In 2017, 1,403 projects, accounting for 4,256 units, enrolled in Built Green—a 27 percent increase in project enrollments and a doubling of enrolled units! This increase was accounted for by both single-family and multi-family projects. Built Green had a great 2017, and if these achievements and numbers indicate anything, it’s that there’s a lot to come in 2018! *Neither certification nor enrollment necessarily occurs at the same time as permitting, though there is a chance enrolling does. However, we use certifications as a measure despite the time lag, because we want to ensure a project did indeed meet Built Green requirements before we count it.